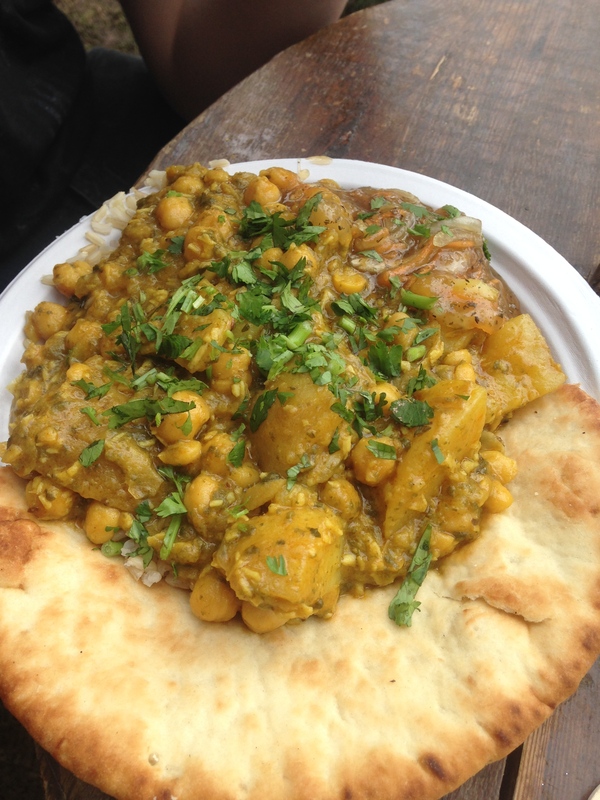 Anyone who is lucky enough to go to Glastonbury Festival knows that the huge variety of eclectic food stalls are second only to the festival’s musical offerings. 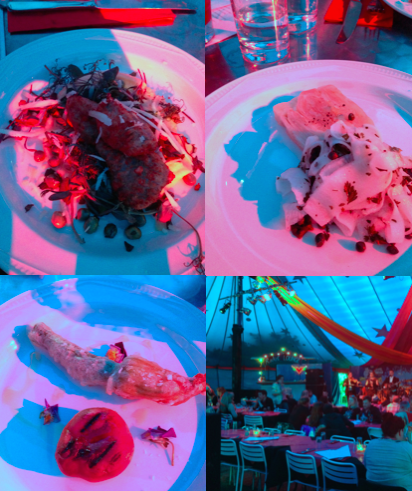 Once again I was one of the lucky few hundred thousand able to sample some of the amazing festival food as well as some incredible acts (almost mere accompaniment to the food for me…) that rounded off another wonderful year. Amongst the soup of mud I found some new gems that I will be visiting again next year, as well as my old favourites from years gone by. 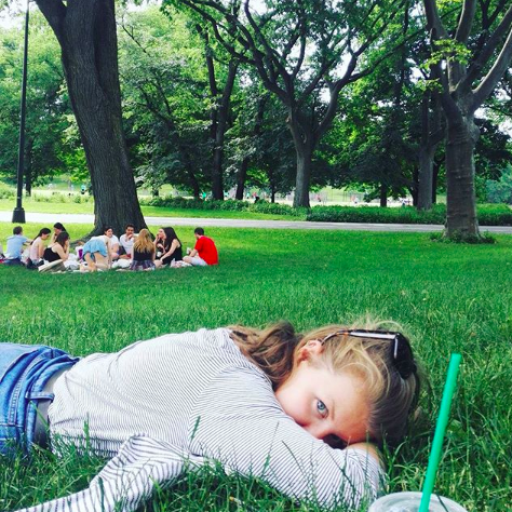 My picks from last year’s festival still stand, although I only revisited Peckish Peacock, Organic Veggie Burgers, Manic Organic and Pizza to the People. 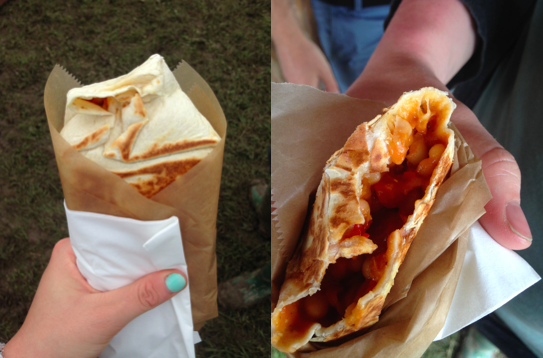 It always amazes me how much delicious food is available for only £3-8 per portion at Glastonbury, as well as more gourmet options being available for those looking for a bit of a different festival experience. I’m looking forward to seeing how the face of festival food changes with the introduction of spaces such as The Rocket Lounge where you can dine on Michelin starred food and accompanying cocktails and champagne. 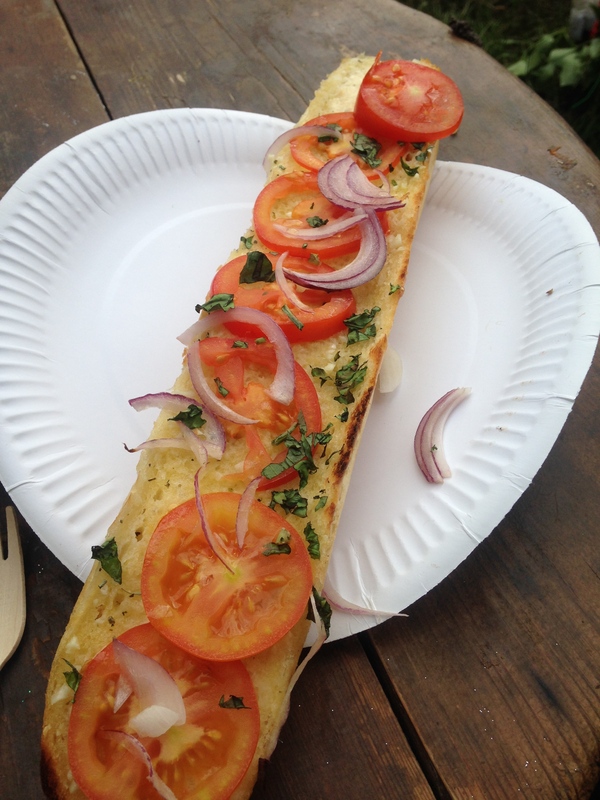 Here’s to another year of tasty Glastonbury fare, you can read about my last year’s favourites here and I hope you enjoy this year’s collection of delicious dishes. I came to Lynda’s Loaf in 2013 for their amazing focaccia and this year did not disappoint. 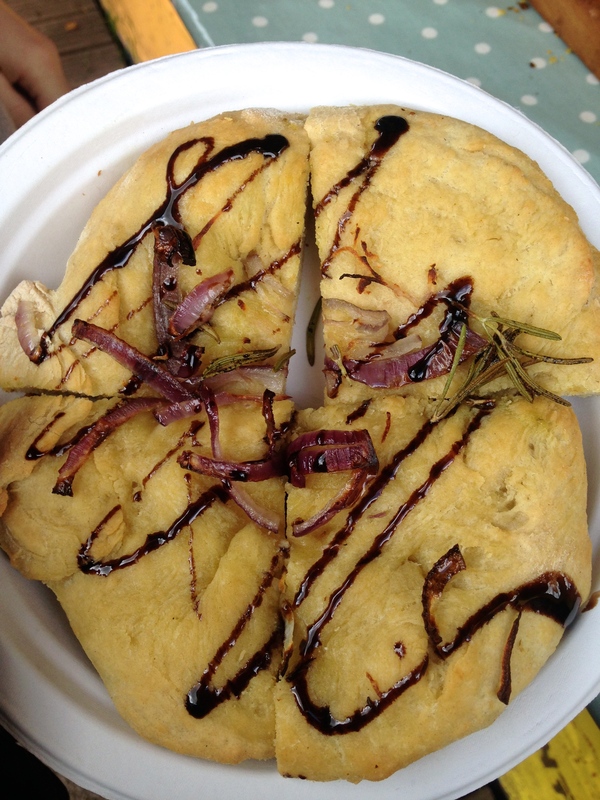 We went for the cheese and pesto bread and the balsamic and caramelised red onion. 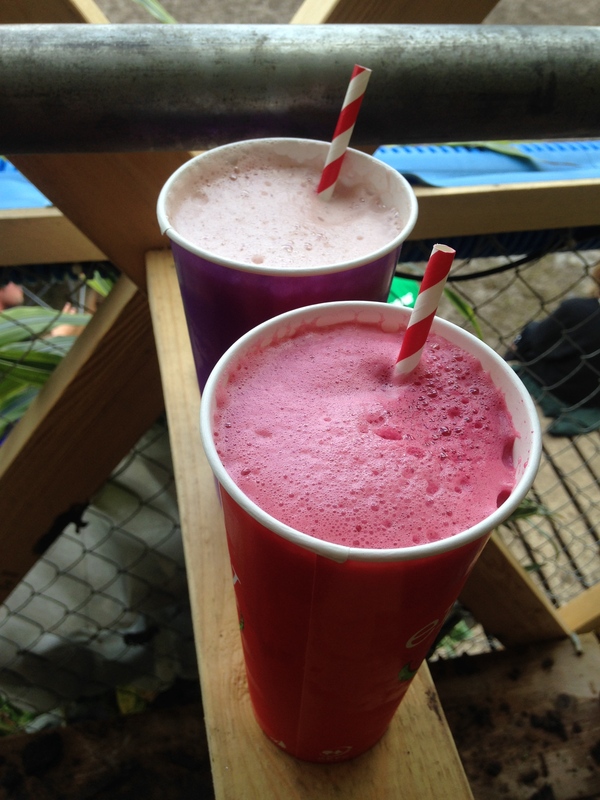 Both were indulgently delicious, served fresh from the oven and exactly what we needed on that muddy morning. These breads are a Glastonbury staple and I love the Greenpeace field as a foodie destination so this one is an all round winner for me. We washed down our focaccia with some elderflower and blackberry and plum presse from Nurse’s Cottage, another revisit but delicious as always and super refreshing. After the sad departure of the Tapas Breakfast stall, who no longer operate at Glastonbury, we were very much on the quest for a substitute delicious breakfast. 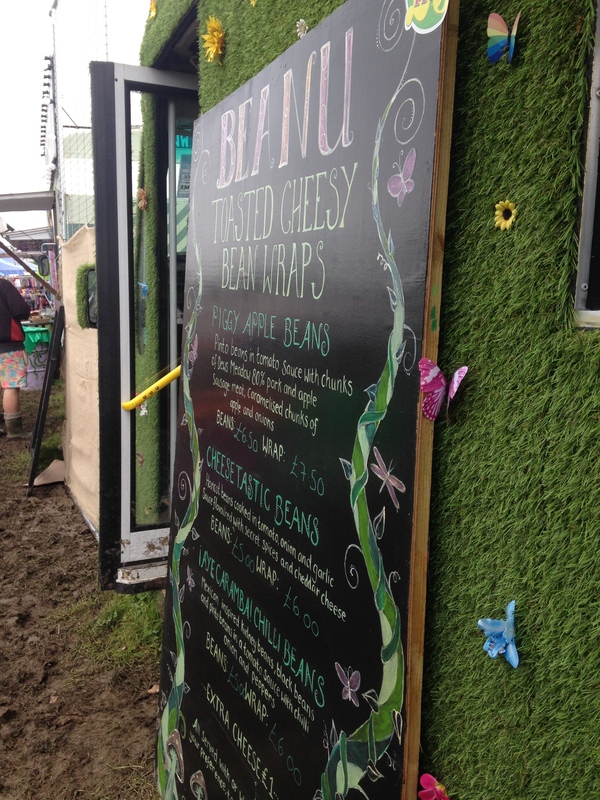 Banging Beans is situated not too far from the Bread and Roses and offers up a delicious portable breakfast- homemade baked bean wraps. 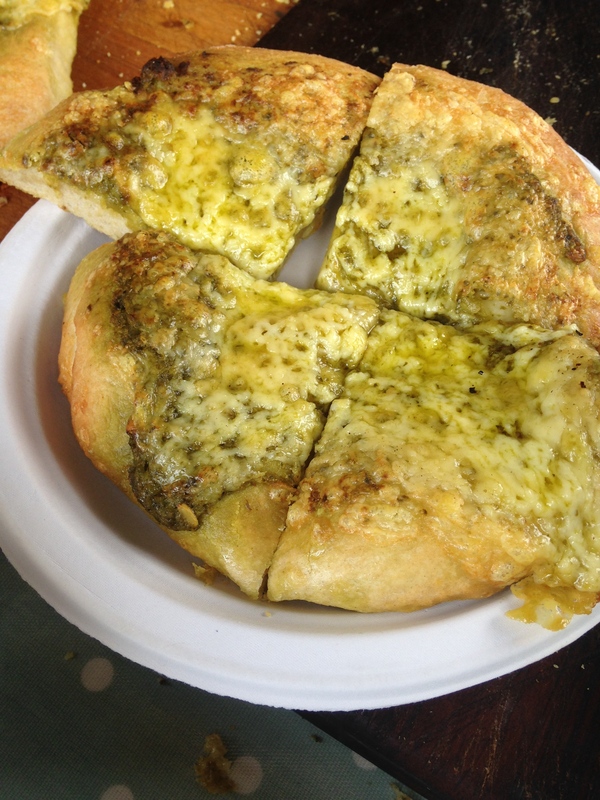 I had the cheesetastic bean option, you can even add extra cheese to this one! 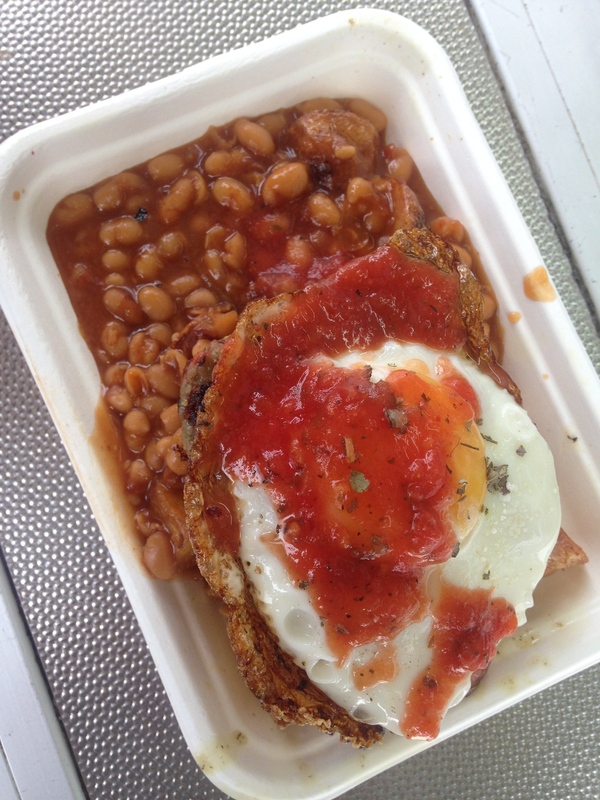 I don’t think anything will quite replace the Tapas Breakfast, but Banging Beans was a firm favourite with almost everyone in our group this year. Manic Organic is another Glastonbury Staple. This stall based near Greenpeace always produces amazing vegetarian and vegan food for a good price- never fails to disappoint hungry festival goers. This year I had the bruschetta and coconut and potato curry. Manic Organic are always wonderfully generous with portion sizes, so if you’re after a hefty meal that tastes amazing then this is the place for you. I think that The Parsnipship could become one of my Glastonbury favourites alongside the likes of the Peckish Peacock and Lynda’s Loaf. It offers up delicious vegetarian and vegan options, including a veggie breakfast that we tried and found extremely tasty, as well as a wonderful glamorgan crumble with cous cous salad and horseradish creme fraiche. I forgot to take a picture of the glamorgan crumble because we were just enjoying it too much, the mark of a good meal I’m sure! 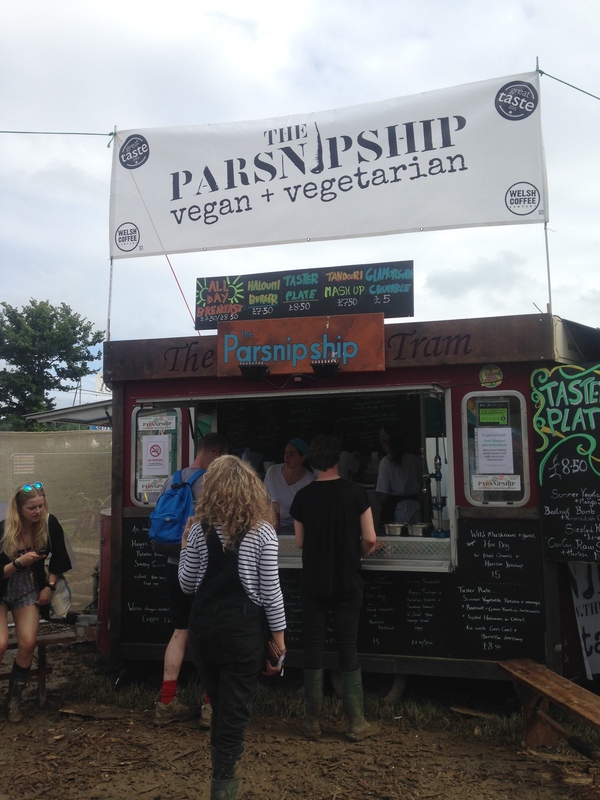 The Parsnipship is at the top of the Park, perfect for taking up to the Glastonbury sign or devouring whilst watching the Park Stage from afar. If you’re anything like me, sometimes you just crave something good and sweet with a cup of tea for a pick me up mid festival. 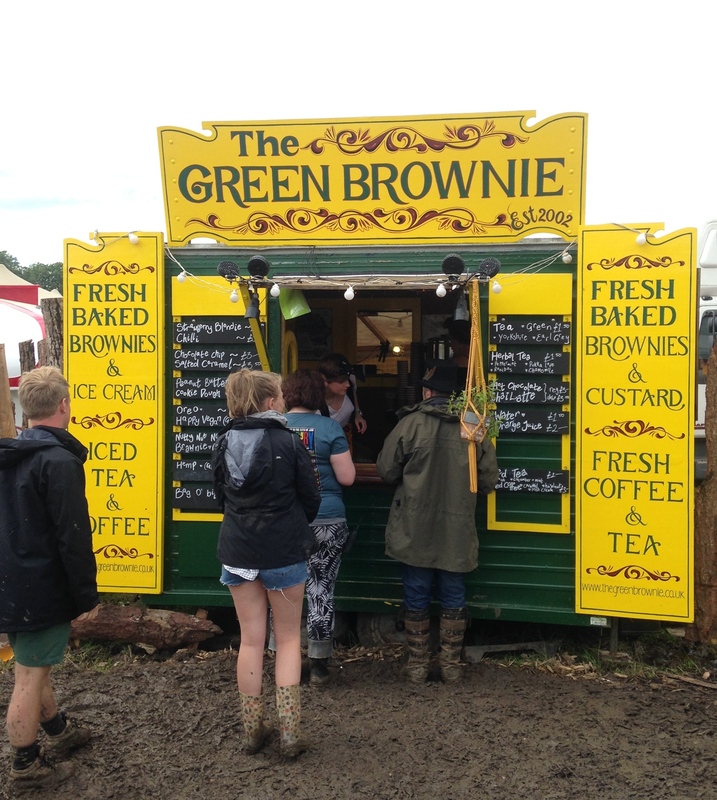 Although this may sound incredibly twee, The Green Brownies offers up a really good selection of brownies with £1.50 tea that satisfy any sugary cravings. 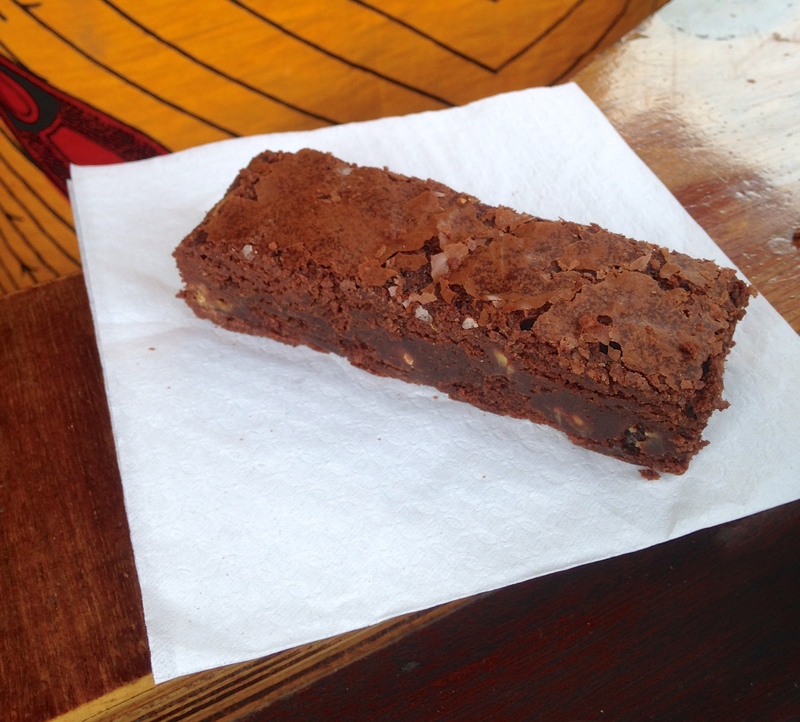 I had the chocolate chip brownie, which was delicious, if a little dry, and I wish I’d had a sweet enough tooth to try some of the other flavours too! This one is a little different from my usual festival food choice. On offer in the Rocket Lounge is fine dining on proper tables and chairs with accompanying live jazzy music. One of the pricier options at the festival, this is definitely a treat and I would thoroughly recommend. The veggie options were delicious, goats cheese stuffed courgette flower with peach, caramelised onion tart with beetroot salad, crispy artichokes with peas, broad beans and creamy polenta, and an extremely decadent chocolate hazelnut dessert. Apologies for the appauling pictures here- ambient lighting to make a tent seem more glamorous didn’t do much for my photographic skills! I would love to know any of your favourites from this year’s festival, so please don’t hesitate to comment with your suggestions!